VietNamNet Bridge - Here are 10 pagodas you should not miss because they are home to unique statues in Vietnam. There are more than 70 wooden statues in different postures in this pagoda. 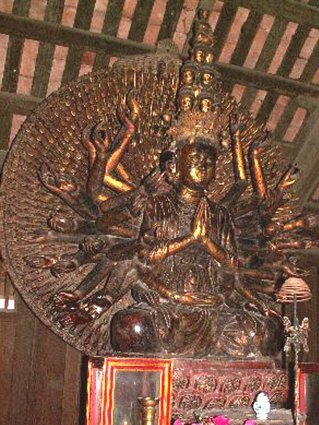 The Avalokiteśvara statue with 1,000 eyes and 1,000 arms. But Thap Pagoda has the pen name of Ninh Phuc Tu. It is located in But Thap hamlet, Dinh To commune, Thuan Thanh district, Bac Ninh province. This is a an untouched pagoda and with a big architectural scale in the North Delta. The pagoda houses the largest Avalokiteśvara statue with 1,000 eyes and 1,000 arms. But Thap Temple is one of the most famous pagodas in Vietnam. Inside, there are valuable ancient objects and statues, which are considered to be Vietnamese masterpieces of 17th-century wood carving. The temple became famous for the venerable abbot and Zen master Chuyet Chuyet - 1590 - 1644. The pagoda has 10 buildings spreading for 100 meters from the three-entrance gate to the bell-tower and back house. Inside the temple are more than 50 statues of different sizes including the Triad Buddha, Manjusri (Van Thu) on a blue lion and Samantabhadra (Pho Hien) on a white elephant. 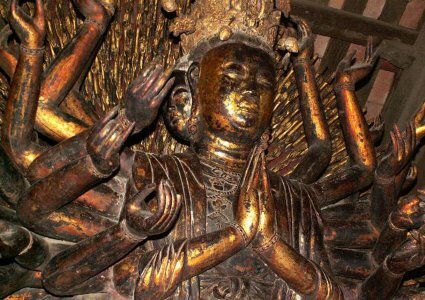 The most remarkable is the thousand-handed and thousand-eyed Guanyin, which is described as a sculptural masterpiece of Vietnam. The architecture, sculpture and decoration of the temple were exclusively confined to the 17th century, so it is the best intact and typical example of Vietnam’s classical Buddhist art. The oldest stone-made Goddess of Mercy statue in Vietnam in Huong Tich Cave of Huong Pagoda. The Huong Pagoda (Perfume Pagoda) is a vast complex of Buddhist temples and shrines built into the limestone Huong Tich mountains. It is the site of a religious festival which draws large numbers of pilgrims from across Vietnam. The centre of the Huong Temple lies in Huong Son Commune, My Duc District, Hanoi. The centre of this complex is the Perfume Temple, also known as Chua Trong (Inner Temple), located in Huong Tich Cave. 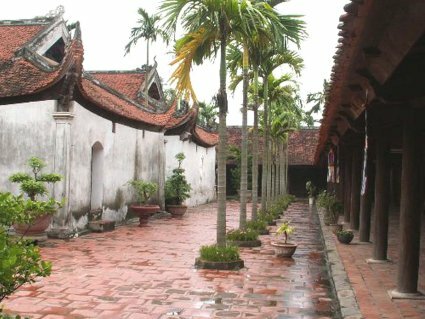 It is thought that the first temple was a small structure on the current site of Thien Tru which existed during the reign of Le Thanh Tong in the 15th century. Legend claims that the site was discovered over 2,000 years ago by a monk meditating in the area, who named the site after a Tibetan mountain where Lord Buddha practiced asceticism. A stele at the current temple dates the building of a terrace, stone steps and Kim Dung shrine to 1686, during the reign of Le Hy Tong, at around the same time that Chua Trong was being constructed. Over the years some of the structures were damaged and replaced. The original statues of Lord Buddha and Quan Am were cast from bronze in 1767 and replaced with the current statues in 1793. More recently, damage was done during both the French and the American wars. Both the gate and the bell tower at Thien Tru Pagoda were destroyed, the bell tower rebuilt in 1986 and the gate completed in 1994. The center of the Chua Huong complex, Huong Tich Cave houses Chua Trong (Inner Temple). The mouth of the cave has the appearance of an open dragon’s mouth with Chinese characters carved in a wall at the mouth of the cave. The characters (Nam thien de nhat dong) are translated as “first grade cave of the South World” and the carving is dated to 1770. The words are attributed by some to the ruler of that time, Thinh Do Vuong Trinh Sam. Inside the cave there are many statues. 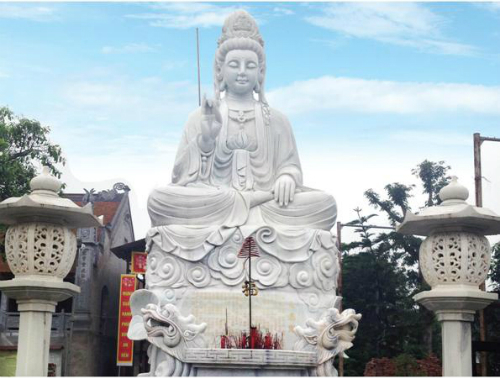 There is a large statue of Lord Buddha, as well as one of Quan Am (Goddess of Mercy), both made of a green stone. The Quan Am statue is the oldest green stone-made of its kind in Vietnam. 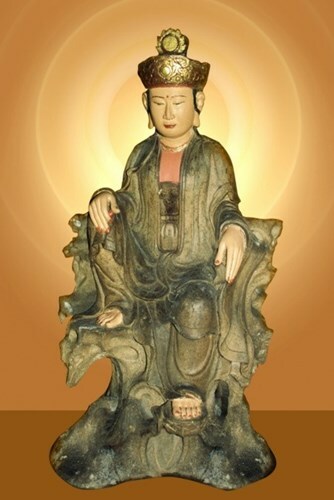 There are also statues of Arhats and various other figures. Among the naturally occurring features of the cave are numerous stalactites and stalagmites, some of which are worn smooth from years of rubbing by visitors to the cave. Quan Am Pagoda in Dong Anh District, Hanoi, is the home to the biggest Bodhisattva statue in white stone in Vietnam, with the height of 5.7m, and the weight of 37 tons. The statue of Avalokitesvara Bodhisattva is made from white monolithic stone taken from the central province of Nghe An. Quan Am Pagoda was built under the Ly Dynasty and it has been renovated several times. It is carved on ancient steles that in 1108 the Ly Dynasty extended the Red River dyke. Therefore the pagoda was moved to its current location. This pagoda preserves many ancient statues and a large bell with the style art of the XI century. Buddha statue placed in Phap Chu palace. Located behind a range of limestone mountains in Gia Sinh Commune, Gia Vien District, Ninh Binh Province, the site with construction lying in disorder makes it difficult to imagine its beauty and solemnity of a pagoda in the true sense of the word. However, its great size and imposing nature can be felt when visiting it one time. Its back leans against the Bai Dinh Mountain with the height of 200m. The area for constructing Ba Dinh Pagoda is 80ha, which is located on the mass of “Bai Dinh Pagoda hallowed culture” belonging to Trang An Tourism Area. Currently, this mass has many items including Tam The (Past, Present and Future) Temple, Sanctuary and Bodhisattva Kwan Yin statue, Dharma Temple, Bell-tower, Three-door temple gate, and dormitory area for Buddhist monks, etc. In front of Pagoda valley, a hundred excavators, bulldozers and power-shovels are digging land and building a dike to make a huge semicircular lake, which will take water from the river crossing to create a landscape of “on shore and under boat” like the Yen Stream flowing under the foot of Huong Tich Pagoda. The most important of these great religion works are still Tam The Temple and Dharma Temple. The area of two Temples up to 1.000m2 (area of the main sanctuary of traditional pagodas is maximum 150m2 because it is limited by compartments - stipulated by the length of wood beam). The height of Dharma Temple is 22m; it contains four achievement-record statues inside. Four statues - three bronze Tam The statues and one Great Buddha Shakyamuni statue - are the pride of the “owners” of Bai Dinh pagoda. 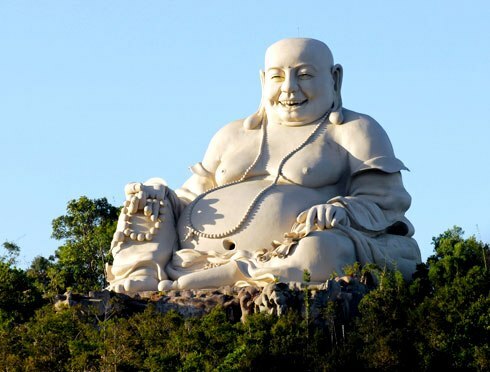 Each statue of Tam The weighs 50 tons, 12m high, Great Buddha Shakyamuni statue 16m high and 100 tons, which are cast in pure bronze bought from Russians, cast and installed by famous artisans that cast bronze statues in Y Yen in Nam Dinh. A “great bell” with the weight of 60 tons was cast and located on the top of hill on the way to the main sanctuary. The Great Bell is so big that it would take a big log of wood and four people to pull the log of wood to strike the bell. There is also an astonishing “collection” of 500 Arhat statues on the hill on the right of Dharma Temple. 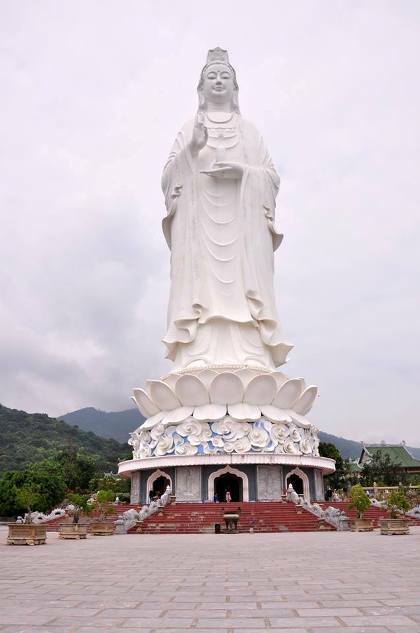 The 67-metre-tall Goddess of Mercy statue standing on a lotus-shaped platform. Built on a site of 12 hectares on the Son Tra Peninsula, this is the largest pagoda in Da Nang in terms of scale and artistic architecture. The pagoda is famous for its beautiful 67-metre-tall Goddess of Mercy statue standing on a lotus-shaped platform. A large courtyard containing many statues leads visitors to a giant three-door gate. From here visitors can relax their minds by gazing across the boundless sea below with numerous boats bobbing on the water and to the Marble Mountains in the distance, or cast off all their worries by looking at the gentle face of the Goddess of Mercy statue to the right. Locals believe that this Goddess of Mercy statue, which faces the sea, will take care of fishermen and give them the strength to deal with storms and high waves. Inside the statue, which is equivalent to a 30-storey building, there are 17 levels, allowing visitors to admire the view from different heights. Each of the 17 levels houses 21 Buddha statues, with different appearances, expressions and gestures. Standing in line on both sides of the main courtyard are 18 statues of arhats in a traditional spiritual rite, showing all of their expressions of joy, anger, love and hate. 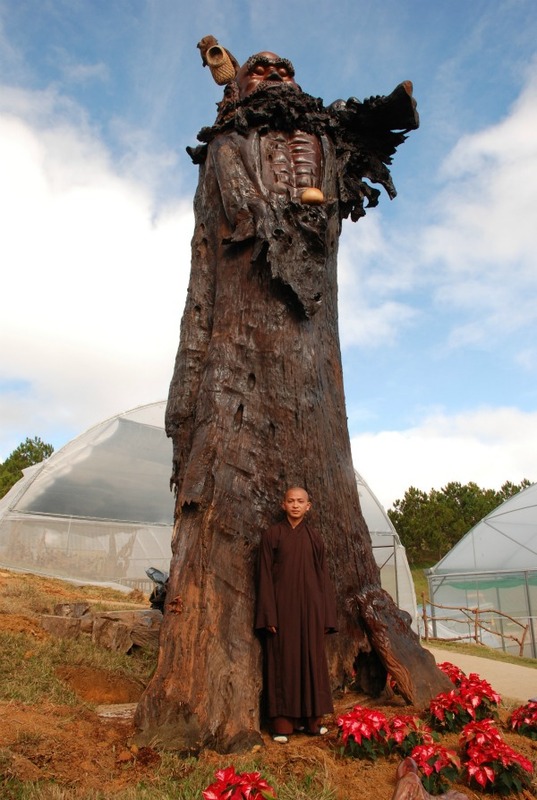 The largest Bodhidharma statue made of sao timber in Vietnam. Also called Ve Chai Pagoda, it was built in a mosaic style from glass, pottery and porcelain shards between 1949 and 1952 in a residential area southeast of Da Lat. The front of the pagoda is lined with ornate pillars in the shape of flying dragons, while a 4.8 metre tall statue of Buddha sits amidst 12 glaze-work reliefs which illustrate the story of Buddha. The 49-metre long winding mosaic dragon standing near the pond is the main drawcard. Linh Phuoc pagoda is in the Vietnam Record Book as the pagoda with the highest bell tower in Vietnam. The bell tower is nearly 38 metres high and houses a 4.3 metre/8.5 tonne bell. The pagoda is also the home to the largest Bodhidharma statue made of sao timber in Vietnam. 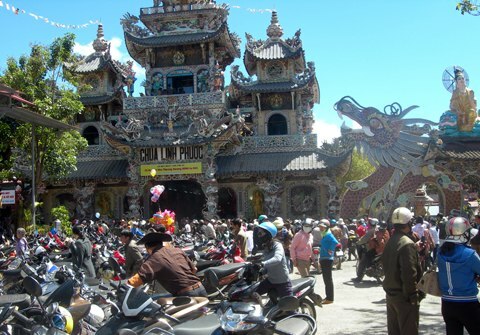 Ta Cu Pagoda is a temple on Ta Cu mountain, Ham Thuan Nam District, Binh Thuan Province. 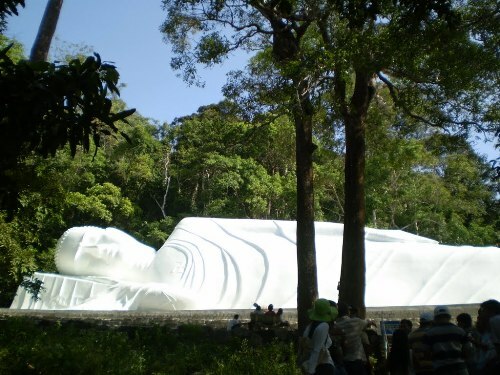 The statue of Reclining Buddha of Ta Cu is the longest reclining Buddha statue in Vietnam, and depicts Buddha entering parinirvana. It is forty-nine metres long and eleven metres tall. The statue was begun in 1963, being finally completed in 1966, and has become a favourite hotspot for tourists. This is an historic Buddhist temple built in 1741 in the town of Thu Dau Mot, Binh Duong Province in southern Vietnam. 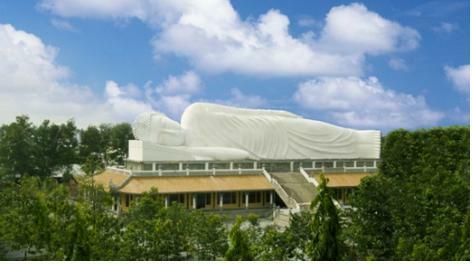 It also has the longest Buddha statue in Vietnam, which was inaugurated in 2010. 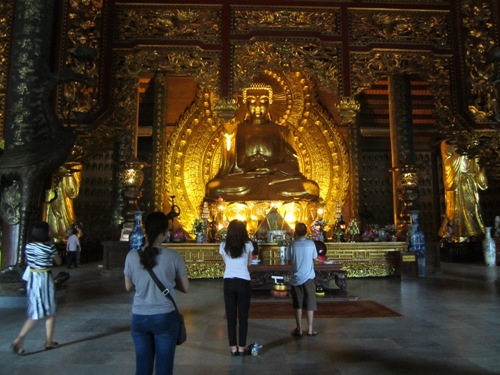 The statue covers 3,200 square meters out of 13,000 square meters of Hoi Khanh pagoda. The primary stairs to the Buddha statue, which is 24 meters from the ground, has 49 steps, symbolizing the 49 years he practiced his philosophy. Around the statue is a terrace and along the staircase and terrace are 52 stone lamps symbolizing the 52 articles offered to the Buddha. The platform is carved with 20 reliefs showing the Buddha from his birth to when he entered Nirvana. Around the statue are 840 lotuses made of concrete. Also located in Thu Dau Mot, Binh Duong, Tay Tang temple attracts visitors with the largest Dat Ma To Su statue made of hair in Vietnam. 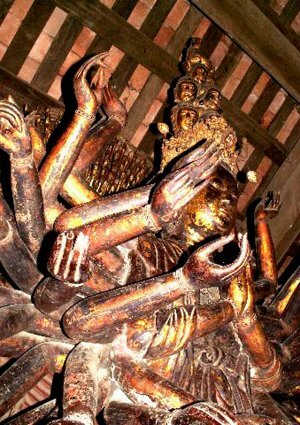 The statue is 2.32 m tall, is made mainly from Buddhist hair, molasses and mortar. A special feature of the statue is its Vietnamese style as the Dat Ma hangs on a conical hat on on the pole. To see the largest Maitreya Buddha on the mountain in Asia, you should go to the Big Buddha Temple in Forbidden Mountain, An Hao commune, Tinh Bien district, An Giang province. Thirty four metres in height and with a merciful smile, the Maitreya Buddha statue on the peak of Cam Mountain has been recognised as the largest Buddha statue by the Asia Book of Records. The statue has a height of 33.6 metres with a pedestal of 27×27 metres; the statue grounds total 2.2 hectares. It highlights a merciful smile and a big stomach – the typical characteristic of Maitreya Buddha. The statue pedestal is made from stone with high levels of reflecting glass, having the significance of diamonds. The statue was built over a two-year period by 60 workers.